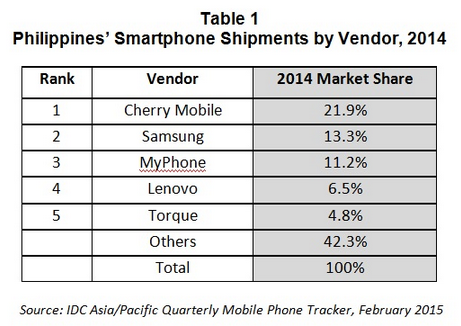 Based on market information and figures gathered by the International Data Corporation (IDC) for the entire length of 2014, a total of 26.8 million mobile phones were shipped to the Philippines that year and local electronics giant Cherry Mobile captured 21.9% of the entire shipment, enough to make it the number one smartphone vendor by a clear mile. Previous #1 handset seller in the Philippines, Samsung, fell to second place with 13.3% market share while Chinese brand Lenovo - which is a relatively new player in the local scene - got 6.5% of the market giving it the 4th spot in the rankings. Mr. Daniel Pang, Senior Research Manager of the Client Devices group at IDC Asia/Pacific offers his explanation for the success of Cherry Mobile as well as other Pinoy handset brands (MyPhone at #3 and Torque at #5) in the country, "The success of local smartphone players is an offshoot of heavy marketing, celebrity endorsements, and price-competitive offerings. Branding is critical in the Philippines. The thriving local vendors are those that not only offer budget-friendly smartphones, but also produce strong ATL campaigns and are endorsed by popular celebrities." On top of that, Cherry Mobile is notably one of the top electronics brands in the Philippines that are most active in working with tech bloggers, tapping them to promote their handsets in various digital marketing platforms apart from their own blogs, including Facebook, Twitter, Instagram, and Youtube. Also, CM is one of the first Pinoy companies to have its own Digital Marketing team handling all of its efforts to advertise in all current online channels.